"Leonard Warren emerged as the principal baritone of the Met’s Italian wing in the early 1940's and remained so until his untimely death on the Met’s stage, 4 March, 1960, at the peak of his career. His smooth, velvety, and beautiful voice was powerful and had an unusually large range in its high register. 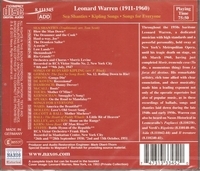 It was easily and evenly produced, whether he sang softly or roared like a lion….Warren acted his roles primarily by vocal coloring, expressivity, and his excellent diction….his singing was unusually consistent….Warren’s legacy should be of interest to all lovers of great singing."